Into that dangerous climate of hatred marched Huey Long, a friend of the poor, regardless of color. African Americans loved Huey because his programs for the poor helped them immensely. Before Huey Long, politicians neither cared about blacks, nor dared to help them for fear of retribution from the Klan. A poor African American boy in Depression-era Louisiana. To the outrage of the Klan and its sympathizers, Huey Long’s programs to uplift the poor meant that African Americans received public education, healthcare, tax exemptions, and the opportunity to vote free of charge (although the vast majority were still blocked from voting by local "Jim Crow" laws), among other benefits aimed at freeing the disenfranchised from the shackles of poverty. Black ministers even organized Share Our Wealth clubs among their congregations with Long’s blessing, a radical inclusion in 1930s America. 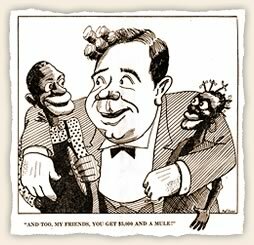 A man without personal racial prejudice, Huey Long had a different kind of problem with racism. Discrimination toward blacks was widespread among the voters, and sometimes a central issue in his opponents' campaigns. The powerful Ku Klux Klan always opposed Huey and tried to pressure others to vote against him. Especially damaging were opponents' newspaper cartoons of Huey with his arms around black folks, promising them schools and economic benefits. 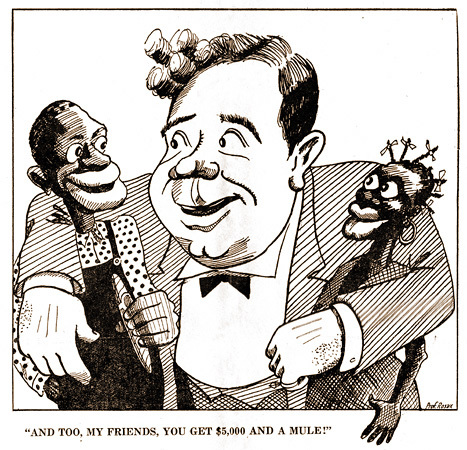 In a cartoon from a broadsheet sponsored by "thousands of Louisiana white patriots", Huey Long is criticized for advancing programs that benefited African Americans. The text of the broadsheet focuses on the dangers of abolishing the poll tax and refers to black voters as the "mongrel vote". Huey's politically unique compassion for African Americans traces to certain elements in his upbringing. Certainly the Biblical commandment to "love thy neighbor as thyself" was constantly preached and practiced in his childhood home, without any color requirement. Huey's part Yankee lineage was probably another source of his contempt for racial prejudice. His great-grandfather, the Reverend James Long, was a Methodist minister who came south to Mississippi from Maryland by way of Ohio. Huey's grandfather, John Murphy Long, was born in Ohio and was sixteen years old before his family moved south. By then, John's allegiance to the Union had been formed. He kept a low profile during the Civil War, considering it to be a war for rich men and fools. 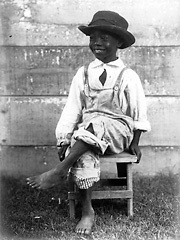 John Long had no association with slaves and probably no objection to their emancipation. To avoid confiscation of his property by the Confederacy, John moved his family and livestock to the frontier of Winn Parish, Louisiana, which voted against secession from the Union.